Built in 1966, the building was originally named the Chicago Civic Center, but was later renamed in honor of the former Chicago Mayor Richard J. Daley. The Circuit Court of Cook County and several government agencies currently reside at the historic building. The center also features one of the largest law libraries with a wide collection of books on both local and foreign jurisdictions. Richard J. Daley Center is also an important cultural destination in Chicago. 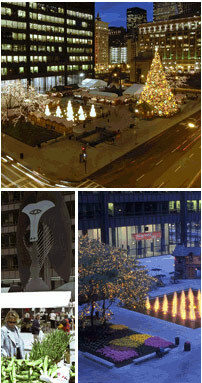 Sitting in front of the building in Daley Plaza is a custom designed steel sculpture by renowned artist Pablo Picasso. Throughout the year, Daley Plaza also offers free cultural programming and events to the community, including its Farmers Market, Chicagoween, Santa's House, and more. Convenient parking for the Richard J. Daley Center is available at the following parking locations. Click the location address to see more information about that parking location.